Small Business Success requires small business owners to continuously evaluate small business performance and take corrective actions, where needed. Sadly, with several small business owners that I have worked with, that is not the case. In some cases, small business owners worked in their business for a very long time, but cannot afford to retire. In general, they perceived that the value of their business is more that it can sell for. This shows that these owners did not do small business performance measurement. In addition, they did not do proper retirement planning and had no business exit strategy. As a small business owner, you work very hard to be successful. By managing business performance, you can increase your business value, by lowering the level of business risk. Valuable Startup Strategic Guidance: Identifying and quantifying business performance indicators provides valuable guidance to entrepreneurs when starting up a small business. To elaborate, it stimulates strategic thinking, aids in formulating business strategies and helps to create meaningful business plans. Small Business Funding and Valuations: Small business performance information helps investors, bankers and analysts to quantify the value and risks of your small business. This is useful in securing business financing for startup or obtaining subsequent funding for business expansion/operations. It could be a helpful adjunct to negotiate a decent selling price for your small business at exit (if you want to sell). Benchmarking and SWOT Analysis: Business performance indicators allow you to compare your business to similar businesses and competition to establish benchmarks (standards or points of reference). Evaluating and comparing small business performance measures helps during your SWOT (Strengths, Weaknesses Opportunities, Threats) Analysis to identify and quantify your business’s strengths and weaknesses in order to be competitive. Track Small Business Performance Goals/Trends: Small business performance measurement helps you to measure progress towards reaching your business goals set during your strategic planning sessions. Comparing present small business performance to past performance allows you as a small business owner to diagnose and adapt to trends. These trends could potentially devastate or benefit the health of your business. 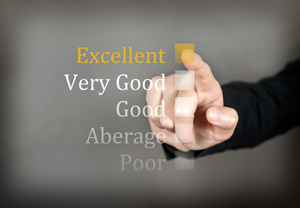 Meeting Customer Expectations: Small business performance indicators should cover measures that represent customer satisfaction/service to ensure that their expectations are met. Controlling Business Operations: Small business performance measurement helps you to keep your finger on the pulse of the smooth running of your business processes. It helps you to monitor resource efficiency and utilization and identify where action is needed. Internal and External Communication: Small business performance measurement is essential for leadership direction and feedback to ensure that outside interests, stakeholders and employees are aligned. It also indicates to employees the level of performance expected from them. Learning and Creativity: Learning is an inherent side benefit of small business performance measurement. Creativity is stimulated when staff develop better ways to meet key business performance objectives. Meaningful Accounting: Designing your chart of accounts around your business performance measures not only provides a set of books for financial reporting and taxation, but also provides additional useful small business management information. Balance Workload – Business performance measures are key to ensuring that workloads are balanced and that individuals are not overwhelmed. It can also help reduce or eliminate inefficiencies. Next Post: The 6 Reasons – Why Do Small Businesses Fail?